The Shack: Where Tragedy Confronts Eternity. William P. Young. Orig. Windblown (3,595,467). The Shack? And it sold 3.5 million copies? That doesn’t quite make it the biggest selling book of the year (Dan Brown gets that honor), but it’s a pretty strong second and a massive publishing phenomenon. And I’ve never heard of it. 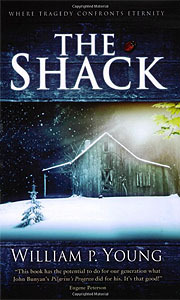 Young originally wrote The Shack as a Christmas gift for his six children with no apparent intention of publishing it. After letting several friends read the book he was urged to publish it for the general public. In 2006, Young worked closely with Wayne Jacobsen, Brad Cummings (former pastors from Los Angeles) and Bobby Downes (filmmaker) to bring the book to publication. They had no success with either religious or secular publishers, so they formed Wind Blown Media for the sole purpose of publishing this one book. ….The Shack went largely unnoticed for over a year after its initial publication, but suddenly became a very popular seller in the summer of 2008, when it debuted at number 1 on the New York Times paperback fiction best sellers list on June 8. Its success was the result of word of mouth promotion in churches and Christian-themed radio, websites, and blogs….As of January 2010, The Shack had over 7 million copies in print, and had been at number 1 on the New York Times best seller list for 70 weeks. This is a really fascinating story — and obviously since it was a NYT #1 bestseller for 70 weeks it’s not exactly a big secret. Still, I’d never heard of it. Why? Even if I don’t make a habit of reading the NYT bestseller list or perusing Christian websites, this is a big enough phenomenon that you’d think I would have seen it on CNN or the Washington Post or Newsweek or something. But I haven’t. Is it just me? Or has it somehow not generated much mainstream attention even though it’s practically a made-for-Hollywood story? You haven’t heard about it for the same you reason you probably didn’t hear about Rick Warren’s Purpose Driven Life series of books until Warren become a lightning rod figure in the news or about the Gaither Homecoming Friends Gospel Music Series, which outsold Elton John, Fleetwood Mac and Rod Stewart for worldwide ticket sales not too long ago. MSM and mainstream American culture just doesn’t know where to look and/or how to talk about or take seriously evangelical culture if it’s not through the culture war or political polarization lens. I study and write about evangelical culture for a living and it used to be astonishing to me how many otherwise very bright and engaged, informed and curious intellectuals and scholars of American culture and literature I’d meet who simply had NO CLUE about vast swaths of contemporary American (religious) culture that isn’t exactly hiding. After a decade or so of this work, I’ve come to expect it, and indeed, to capitalize on it (I’m writing a book right now about the cultural function of white gospel music — yes there is such a thing … gospel doesn’t only mean BLACK gospel). But in general, you aren’t alone in having no clue about this stuff. True. But this is such a great Oprah-esque story that I’m still surprised it hasn’t gotten a little more attention.